Choose Destination Asia & Africa Australia/NZ Canada Caribbean/Bermuda Central/So America Europe Hawaii Mexico South Pacific UK & Ireland U.S.A.
With more than 2,300 square feet, this 3-bedroom offers a canal view and a swimming pool. View this and many other dream homes in Florida on realestate.nytimes.com. Discover hot deals and incredible auctions from the world's most exclusive hotels, resorts, cruise lines, and spas. ON SALE NOW! Cranes rise above the Panathenaic Stadium, built for the first modern Olympics, held in 1896. 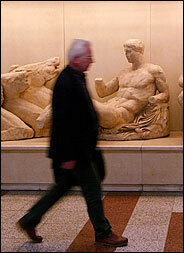 Replicas of the Parthenon marbles in the new Acropolis Metro station (the originals are in London). Food and fashion meet on Kanari Street. harles Baudelaire wrote that ''No human heart/changes half so fast as the face of a city.'' Although the line refers to 19th-century Paris, it certainly applies to 21st-century Athens as it prepares for this summer's Olympics. The metamorphosis of their capital runs so deep that some citizens question what has happened to the sprawling city's distinctive soul and psyche. In the past, whatever Athens's shortcomings, it remained resolutely Greek. Now, critics claim, it's becoming just another European city, with a McDonald's across from Parliament and designer boutiques surrounding the 11th-century church of Kapnikarea. The celebrated Cafe Zonars, for a century a hangout for writers and intellectuals, recently shut down to make way for a mall; streets are clotted with S.U.V. 's; sushi and feng shui knickknacks have put in implausible appearances; and men have quit letting their pinkie fingernails grow long to prove that they're city folks, not country people who work with their hands. All wrong! Athens's defenders argue. Such faultfinding is simple-minded Zorba-ism, a mindless misreading of reality. With a boost from the Olympics, Athens is becoming a fusion city, a bridge between Europe and the Middle East. When the Games begin this August in front of tens of thousands of visitors and millions of television viewers, Greece will showcase its entrepreneurial spirit, contemporary arts and surprising culinary sophistication. True, Olympic preparations have been unnervingly slow, disruptive and expensive, but in the end, optimists say, the last screw will be in place for the first event. As the smallest country to host the Olympics since Finland in 1952, Greece will recapture its ancient glory with games on a human scale. And if Stavros Lambrinidis, director of the International Olympic Truce Center, has his way, the 2004 event will revive the classical ideal, which calls for a global end of warfare during the 16 days of athletic competition. To decide who's right -- the cynics or the optimists -- one can do no better than take a pre-Olympics trip to Athens and sample its ambience, its food and street life. My own exploratory journey in late November started with a flight to the new German-designed international airport, followed by a taxi ride on a toll road that rivals any American Interstate. But there was no mistaking that I was in Greece. The cabdriver smoked, as does apparently every man, woman and child in the country, and he fretted with worry beads as he tuned in bouzouki music on the radio. At the distant fringes of the city, we encountered other forms of local folklore -- gridlock more infernal than in Bangkok and smog (known here as nefos, or toxic cloud) more asphyxiating than in Los Angeles. To complicate the chaos, many streets are blocked by construction, and traffic moves around Olympic sites-in-progress with the ponderousness of a millstone grinding boulders to dust. It's estimated that Athens has more than two million automobiles and 500,000 motorcycles, and at any given moment all of them appear to be stalled in anaconda coils of exhaust. For more than 20 years, motorists have, in theory, driven only on alternate days, according to whether they have odd- or even-numbered license plates. But rather than halve the volume of traffic, this law has prompted many people to buy two cars. As for the much-vaunted Metro, a remarkable system with state-of-the-art equipment and exhibits of antiquities in each station, it has mostly siphoned passengers from other modes of public transport. What's more, no branch of the new Metro serves Olympic sites. Hordes of fans this summer will have to ride on the trash-ridden, flyblown old Electric Railway.